Well, it is "tomorrow". We are waiting for pictures, and more details. I'll be on the road soon. Thanks all for your input. Safe travels. Looking forward to the details. On the way home with (the package). Photos after I resize them on the laptop. I thought I was going to miss out. Went out to dinner, grocery store and patched my roof! I hope Russell made it home safely! Hopefully just some technical difficulties. Well I knew that this was going to be a challenge but, It reminds me of a train wreck. I'm sure many here have seen worse. At least it exists. Giant clam on the objective. 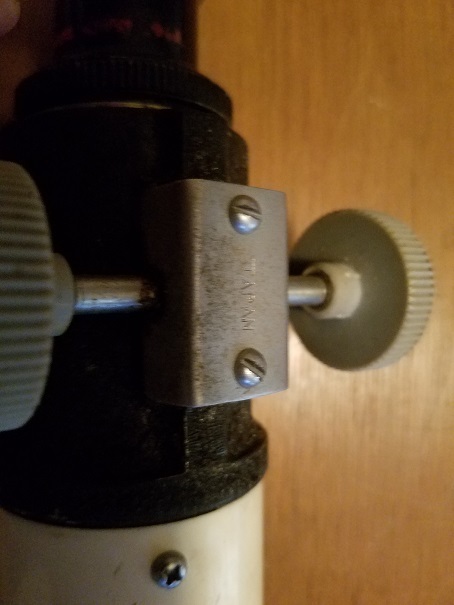 Eyepieces stuck in visual back and diagonal. I.D. tag is missing in action. etc. etc. It may not be as bad as my first thoughts, one problem at a time. Parts missing from tripod should not be too bad to find or make. On another positive note, a standard vixen visual back fits like it was made for it. That is a little different than the HyScore. Notice your finder is mounted to the tube whereas on the HyScore it is on the focuser. It's definitely a cousin. 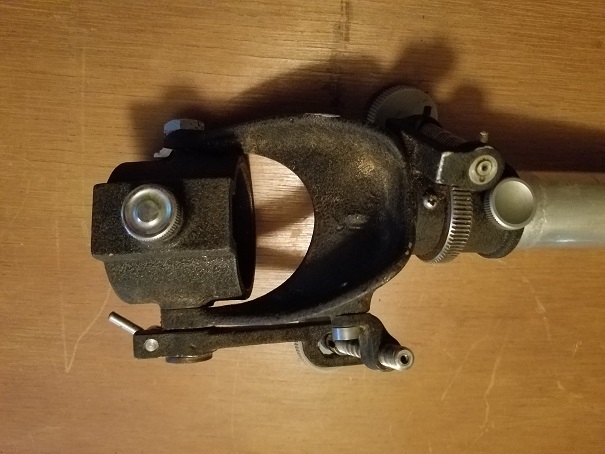 I know Bomber Bob said not to part it out but I sure would like to get my hands on the focuser. Very cool, Russell! Looks like it has a ton of potential. Nice!!! HyScore is probably like the Micronta. The early ones had the finder on the tube and the later ones had it on the focuser. The one Russell just acquired isn't a Micronta though. They only came on a GEM. Whoa! Russell, you done real good. Look at that cradle casting... I'm saying 1957 -- at least 61 years old. Thanks J.W. Not so sure my skills would be up to restoring it, but I am seriously considering giving it a try. Finding the correct objective may prove a serious road block. One step at a time and lots of advice from you pros. I'm still looking for parts to others, but this one is speaking to me. So are those knobs Bakelite or just satin aluminium? CharlieB and/or Terra can correct me, but I think those knobs are melamine plastic, rather than vinyl. Whatever the plastic, I wonder if the same castings were used as with the aluminum knobs -- they look identical. Someone bought my Meemaw a set of melamine plates, bowls, & cups in that light lime sherbet color -- thicker than Corning Ware, but thinner than stone ware. We hadn't moved out of the city yet, so it had to be NLT 1967. She didn't care for this new-fangled stuff, but did put them out for us rowdy grandkids as these were supposedly unbreakable. But... IIRC, that material does get brittle over time & with use. Edited by Bomber Bob, 25 November 2018 - 09:24 PM. I sure hope you can find an objective! For a little 50mm scope, my Micronta provides amazing views. Other than the clamshell, both of our scopes were found in pretty much the same condition. My label and finder were also missing. The finder is rare, but a very kind member of our group here was eventually able to provide me with one, and also a focuser with a badge. It was part of a 3-party trade. Edited by DreamWeaver, 25 November 2018 - 11:24 PM. The 50mm F12 lenses are easier to find -- TOWA sold a ton with the tabletop tripods. I'd check with Sheldon (MASILMW) & Joe (starbird) -- they may have an F10 tucked away. A Bushnell Sky Rover lens would work -- and is most likely an Astro Optical. ASTROLITE, I may have a 50mm focuser. Y'all remember the very old Royal spotter that Brian sold me for the Tinsley? Got a quarterly FJI treatment in the morning, so I'll be home tomorrow. It's somewhere out in the shed. If I can find it, the focuser is available. I'm going to swap its excellent F5 lens with the cheap lens in my GSO RACI finder -- upgrade the plastic diagonal, too. Edited by Bomber Bob, 25 November 2018 - 09:40 PM. Thank you. I am going to need lots of help to make this whole again. Thanks to everyone for the encouraging words. I can't say with any authority what plastic those knobs were made from. They could be Melamine or perhaps Nylon. They do get brittle and I have a small supply of the different styles to replace any of my intact one should the need arise. I think I have five scopes that use them, both 50mm and 60mm. 50x500 mm achromats are not easy to come by. Edmund Optics sells a MgF2 cemented achromat that is said to be outstanding optically and I would certainly have no doubt. These lenses are made to strict tolerances and fully tested to meet specs. However they are not inexpensive. I have two 50x500 cemented achromats. 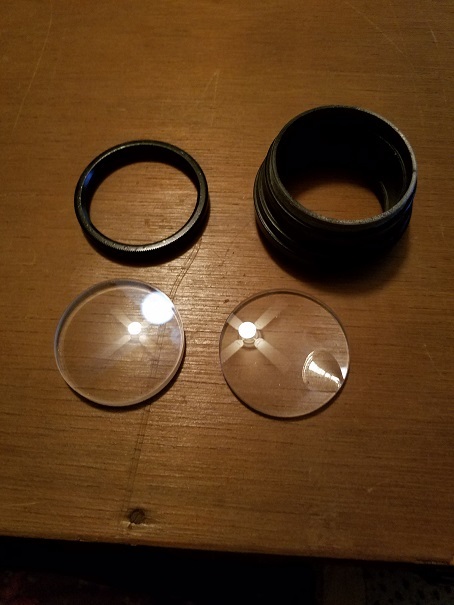 One came with a scope I was gifted, and the other came from a Galileoscope, which uses the achromat 50x500. I was also gifted a 50x500 air spaced achromat which is in the scope now and is a very good lens. The one that originally came with the gifted scope has astigmatism issues. 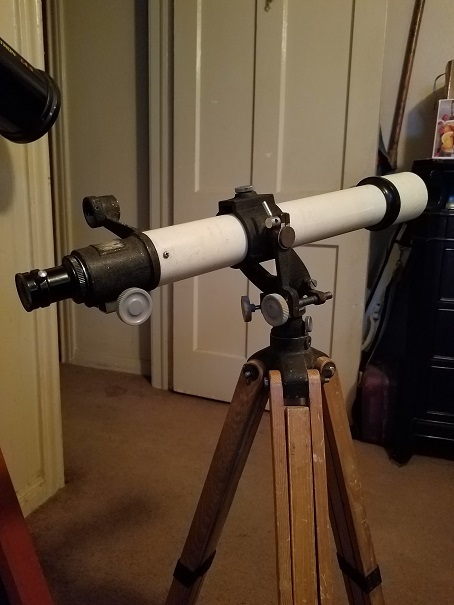 So I picked up the Galileoscope, an inexpensive student scope, and that lens is much better, but not as good as the air spaced. I do recall it gave a nice Airy disk pattern at 60 or 70x, but the star test was best on the air spaced lens. The problem is, I can't recall which is which. What I can do is put each in the Galileoscope housing and run a DPAC to see which one is the better one. If it turns out to be half decent, you are welcome to it. 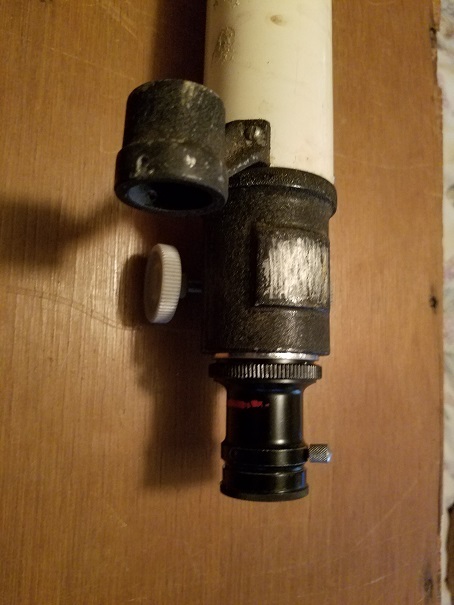 I can get that done tomorrow or the next day if I can find my DPAC eyepiece and post the results here, and you can decide if you want it, no cost at all as was done for me! The Edmund objective is truly excellent but will not fit this objective cell directly. They are a true 50mm diameter and this cell accepts 52mm, IIRC. I had to machine a sleeve to fit around my Edmund objective so that it didn't drop right through the cell. There are a lot of Chinese 50x500mm scopes I see popping-up lately for very little money, they may be an option though I haven't measured the actual diameter of the objectives.